Do your cats need some structure to play on and scratch on, other than the furniture in your home? Get them a cat tree! Cats just love these things and they love having a structure to call their own. 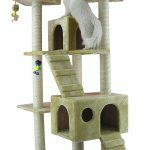 This cat tree by Armarkat is made out of pressed wood with a faux fleece covering and is very sturdy and affordable. The scratching posts are wrapped in quality sisal, which is a great plus. 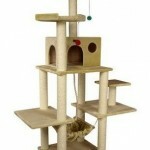 Your cats will be able to use this cat tree for play, sleep and scratching. It’s sturdy enough to support multiple cats, even when they are up on the top platforms and when things get a little more action packed. This cat tree is easy to assemble and comes with everything that you need to put it together, including tools and instructions. What are owners of this cat tree saying about it? First of all, a very common comment is that this is a very affordable yet worthwhile cat tree. It’s half the price of comparable sized cat trees at Petsmart and Petco, for example, and the buyers of this tree will not hesitate to tell you that. Assembly, like with all other Armarkat cat trees, is pretty easy. Buyers of this cat tree are able to get it put together in less than an hour, with some getting it assembled in less than a half hour. It’s common to hear that the cats love playing in the boxes and on the parts during assembly, but any cat owner would probably not find that too surprising! How sturdy is it? Overall it’s a very sturdy unit, even considering that it’s base is only roughly 2 feet by 2 feet square. Many owners of this cat tree thought it would wobble more when their cats got up on the top platform and got a little playful, but only a slight wobble is noticed at most and it doesn’t turn out to be anything to be worried about. How does it hold up? People that have owned this cat tree for a period of time like the way that it does not wear down fast. It holds up well to the cats that like to abuse it. They also find that the scratching posts are surprisingly high quality and durable, being made from tightly wrapped sisal. Any complaints? As with other cat trees that come with dangling toys, people that buy this cat tree are generally not impressed with these toys. They wear out fast and many people tend to not even attach the dangling toys. That is perfectly fine since your cats are going to be a whole lot more interested in the structure rather than the cheap toys, which should just be considered as bonus fluff. Overall, people are quite happy with this cat tree and there really are no major complaints. Just tighten all the bolts securely and consider not attaching the dangling toys and you will find this to be a very good value in a cat tree. Oh yeah, and your cats will love it too! I am so glad I got one of these! !1 It is awesome. My cat’s are so spoiled those guys ahaha.